WWE will return to the Kingdom of Saudi Arabia for a special event on Friday, November 2nd. PWInsider first reported the news on Wednesday afternoon. This will be the second WWE show from the country of the year after the Greatest Royal Rumble back in April. Beyond that, details are scarce. WWE has yet to confirm the location of the upcoming Saudi Arabia show and whether or not it will air on the WWE Network. 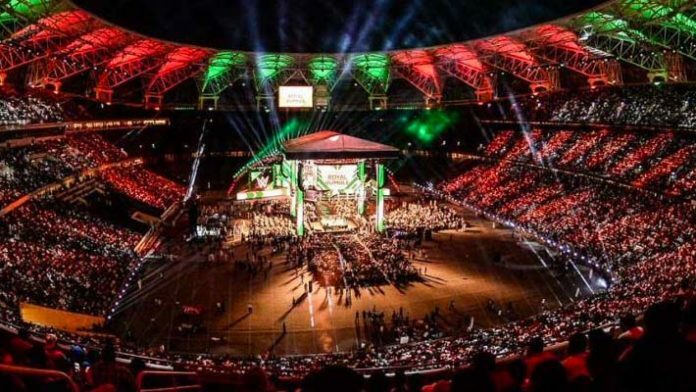 As part of the planning for WWE’s return to Saudi Arabia on November 2nd, the company’s previously scheduled European dates for October have been rescheduled to May 2019. The November 2nd live event is part of WWE’s multi-year deal with the Kingdom of Saudi Arabia. Although the Greatest Royal Rumble was a financial success, it was not without controversy. Due to the country’s conservative social climate, female Superstars were not allowed to participate in the first event. WWE Co-President Michelle Wilson addressed the situation during WWE’s Q1 2018 investor call. WWE executive Triple H has also addressed the sensitive issue, noting that the first show was a “foot in the door” with hopes that progress that will be made over time. Shortly after the Greatest Royal Rumble, the Yamen-based branch of terrorist organization Al-Qaeda issued a warning to the Saudi Crown Prince Mohammed bin Salman, calling his efforts to liberalize the Kingdom as “sinful projects.” The Crown Prince was accused of “opening the door wide for corruption and moral degradation” by allowing the WWE and other aspects of western culture into the Middle Eastern country.